The approach of the general election is reinvigorating debate on the question of if houses ought be built on Cambridge airport. I’ve just been interviewed on Star Heart Radio about my views on the proposals to try and push Marshall off the Cambridge airport site and build houses on it. This was in the news today because the local Labour Party have recently presented a 1,500 person petition against the plans to the County Council. I don’t think the airport site is the right place to build the new homes the city needs. Pushing one of Cambridge’s major employers out of the city is a crazy policy. During the interview I explained I was an independent campaigner who has been trying to get more information about what is proposed and what’s being discussed into the open. For example I’ve reported and commented on what’s been said at city council meetings and at Cambridgeshire Horizons and made freedom of information requests to get information released. I was asked why I thought the petition had been handed in now; and suggested the timing might be related to the upcoming general election. I expressed a caution though against voting Labour on the basis of their local opposition to these plans, as it is the Labour government’s top down housing targets which have put pressure on the city to expand in this way. The Labour Government, Conservative County Council and the Lib Dems running the City all in favour of these plans. There isn’t a main party choice at the next election for those who oppose the way in which the city is being expanded to vote for. We have some good individual Labour councillors, but they don’t appear to agree with the Labour Government on this and don’t appear able to influence government policy. I was asked what I thought might happen next. I said the big upcoming event which might influence the airport site and other proposed development around the city was the general election. I said that if say a Conservative government came into power I’d expect a re-opening of quite a different sort of debate about how new homes are to be provided in the city; focusing on the local need and how Cambridge residents think the city ought expand rather than on reacting to Whitehall dictat. I am though concerned about elements of the Conservative proposals; while I like the focus on genuine localism (not the Lib Dem variety), their proposals include bribing residents of areas by promising cultural and sporting facilities on new developments hoping this will result in local people supporting them. If we are going to double the size of the city then we need massive investment in transport, and other infrastructure, to go with that. We would need visionary strategic projects on a scale we’ve not seen associated with development so far (perhaps with the exception of Northstowe and the “mis-guided” bus; but that’s hardly showing strategic thinking when the question of what happens to the bus when it hits Milton or Histon roads in North Cambridge hasn’t been tackled). Marshall and the type of real engineering jobs it offers is critically important to the city. Diversity is important in terms of employment in the city we shouldn’t just focus on every other person being a web-designer or working in biotech. Marshall have said that if they do move they’ll conduct a UK wide search for a new site so I think the risk of them being lost from the area is real. As for the airport site, it’s their land, its up to them in the end what happens to it, they’re still investing heavily there, having recently built a new hanger. 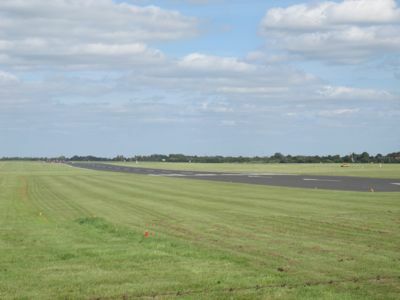 They might be stringing councillors along with the idea of building there to maintain as good a relationship as possible with the hostile Liberal Democrat council; they might be seeking to get the airport site in a position where its not considered part of the green belt – so commercial development related to the airport can get the go-ahead more easily. Developers and commercial interests are almost invariably smarter than those we elect to represent us and often run rings round them. Cambridge has a housing problem; but the plans to develop the outskirts don’t do as much to address that as they could. Only about half the homes being built are to be available on the open market I think that’s a major policy mistake. Affordable housing very rarely means selling houses at cheaper prices, or building cheaper houses. Affordable housing isn’t housing made available to buy on the open market. It has no effect on property prices. It is also certainly not ‘extra’ housing either; every property on a new development which is “affordable housing” is one less property made available on the open market. While these schemes do make housing more accessible; and more affordable for some in the short term, they don’t tackle the underlying problem which is property prices as a multiple of income. If we tackle that underlying problem then the benefits will cascade down to those who are renting. Reducing property prices will result in people paying less over the course of their lives for housing. A Vision for Cambridge in 2020 – This is my most detailed article commenting generally on developing Cambridge. This entry was tagged Cambridge, Development, Planning on March 31, 2010 by Richard Taylor. Marshall has this morning announced it will stay in Cambridge and will not be selling the airport site. Good. They’ll now have to Review their Regional Spatial Strategy whatever that means. I’m praying for a bonfire of these quangos after the election. Oops sorry, keep religion and monarchy out of government! After Goolging the phone number I was called from I’ve corrected the radio station. Oops. While I can’t link directly to Cambridge News polls following their website redesign; at the time of writing the above is on the right hand side of their home page. With almost 90% of respondents saying they’re pleased Marshall are staying in the city, it is one of the strongest poll results I’ve seen on the site. While I realise a Cambridge News poll isn’t an election it does raise a question of why Cambridge residents voted the Lib Dems into power if so many disagree with one of their biggest policies – building houses on the airport site. It can’t be civil liberties either as with dispersal, use of S.59 powers for speeding and careless driving, and the RCCTV system they’re very weak there too. Perhaps they’re just judged best of a bad bunch.